Today, I woke up with cramps from hell. It was terrible. The first thing I thought was, I need coffee. I’m a big coffee drinker on and off, currently off, but when I get cramps, I run to coffee like it’s my savior. I don’t know if you know this, but caffeine can help, naturally, treat pain. If you don’t tolerate coffee well, I’m not saying to chug a pot of coffee, but I do think that if you can drink coffee and your body doesn’t start percolating, try it out. I think it’s a great cure for monthly cramps. 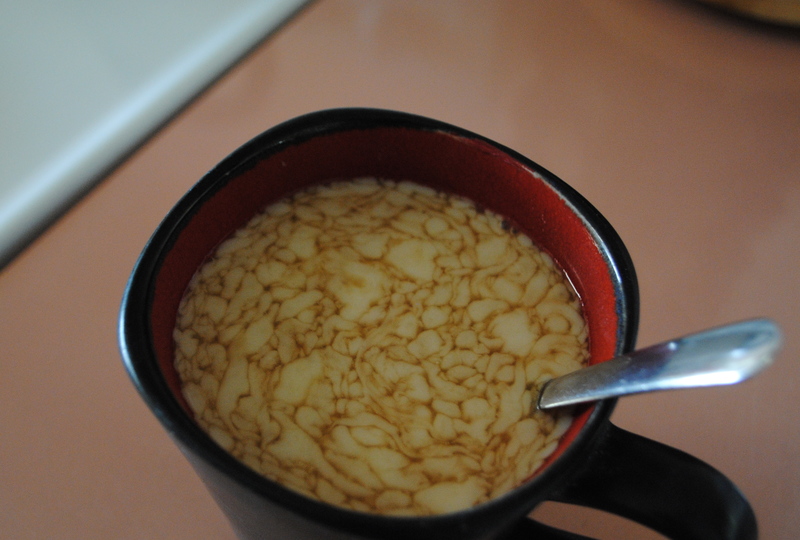 My coffee this morning, with almond milk floating on top. I am pretty sure that I am lactose intolerant so I have been drinking almond milk in place of cow’s milk…and after reading studies on cow’s milk, I’m pretty happy I have made this call…but either way, I feel like I load it up with way too much sugar. I put a whole tbsp in this little cup!! I feel dirty. Once I found out about cold brewed coffee, which sadly I had none of because I haven’t been drinking coffee recently, I was all over it. It’s VERY simple to put together. 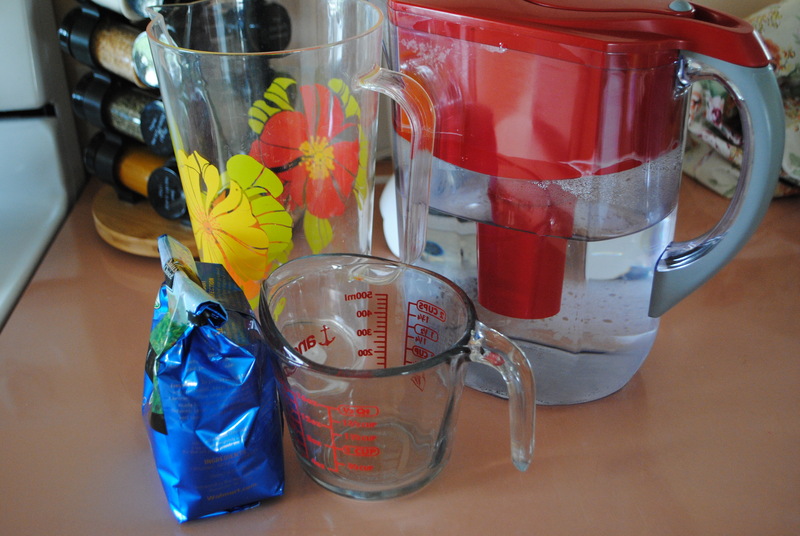 All you need is a measuring cup, 1/3 c measuring scoop, filtered water, organic coffee grounds, a pitcher or large cup, long handled spoon, and something to cover the opening of your pitcher/cup(or if you are have one, you can just use a french press). 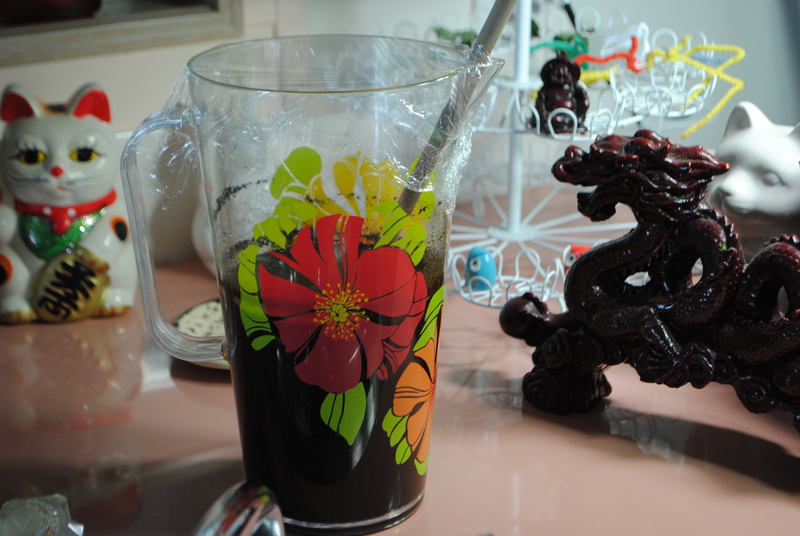 Cold brewing coffee has a different outcome to a hot brewed coffee. The biggest thing, of course, is the fact that they taste different. Almost completely. When the coffee grounds are heated, while they release that amazing aroma, they also create a more bitter brew and also, more acids are released. I would also like to say, that if you make your own coffee, please make it a point to buy organic. Coffee is a heavily spray item and every time you brew your coffee, you are also leeching out whatever pesticide they sprayed on your coffee beans and putting them right into your cup. Adjust your ratios according to how much you would like to make, for instance, if you want to make 3 cups of water worth, add 1 cup of grounds, etc. Simply pour the water into a pitcher or cup and mix together. It’s pretty simple. Cover and place on your counter. The least amount of time I would recommend is twelve hours but you can let it sit for up to 72 hours. I usually let mine sit for 24 hours. Through out the day, go back and give your mix a stir and replace the cover. When you decide that it’s been long enough, I usually get a large bowl and a strainer, with a coffee filter placed in it, and then pour the mixture through the separate the grounds from the coffee. Once you strain all of your mixture, simple pour it into an easy to pour container and store it in the fridge. It lasts for about a week in there, some people say longer. I aim to try and have a weeks worth so I only have to do this once a week. I prefer cleaning coffee grounds off of filters and counters once a week rather than seven. The results of a cold brew have a delicious mellow flavor and some people find themselves salting their coffee rather than adding sugar. I, personally, love to add a tsp of local honey, this way I also get my allergy protection. Cold brewed coffee, also is a concentrate when you make it, so depending on your tastes, you may want to actually add a lot of milk, if you are warming it up, or water, at a ratio of 1:1. It’s a wonderful method if you love iced coffee, especially with this summer heat, because the prepared coffee is kept cold at all times, you fill your glass with ice, add your creamer of choice and any flavoring you desire(I have a thing for cinnamon or a little sprinkle of pumpkin pie spice), and whatever else you would like to do and your coffee and you’re all set. No waiting for your hot brewed coffee to cool down or watching it melt all the ice you put in there and you get a watered down mixture. The fun part of coffee, there is some much you can do to make it your own brew. What do like to put in your coffee? This entry was posted in Food, Uncategorized and tagged breakfast, brewing, coffee, cold, drink, food, iced, recipe by themcdorkins. Bookmark the permalink.